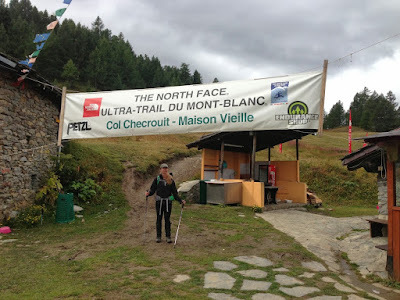 We walked from our rental house to the Chamonix Planpraz cable car, rode to the top, and took the TMB (Trail du Mount Blanc) toward Brévent. Ann had mentioned taking the cable car up and running back down, so I was surprised by the climb at the beginning. After an amazing year full of adventures-- our first 100k atMiwok, running around Rainier, Hood AND St Helens, a PR at the Columbia Gorge half-- I was looking for our next big thing, preferably in our beloved home state. I found the North Umpqua Trail, 72 miles end-to-end along the Umpqua River in southern Oregon. And then I discovered that there was a supported race entirely along it, the NUT 100k. It was too good to resist, so when registration opened, Ann & I signed up. Our race calendar for 2016 filled up and then we got picked for the CCC, one of the Ultra Trail du Mount Blanc (UTMB) races in late August. The NUT fit into our race calendar as the perfect big training run-- a similar distance but about half the elevation gain, and much closer to home. Our running and training was going smoothly, even with our disappointing time at the Peterson Ridge 40 miler, until suddenly, it wasn't. Every week our friend David has been asking us how our training has been going and if we are still planning on running CCC. We half jokingly respond, "what training?" There were probably only a few times after I went to the ER, that I thought I would have to cancel the whole trip to Europe, but I had more than a few doubts about making it to the starting line of CCC. But that was several months ago, every week for the past 2+ months I have been adding 3 miles to my weekly long runs and I am up to ~27 miles for this week. Initially my main goal was recovery more than training, but the last few weeks I have been focused on the race and using the time we have before the race in the most efficient manner, without over doing it.